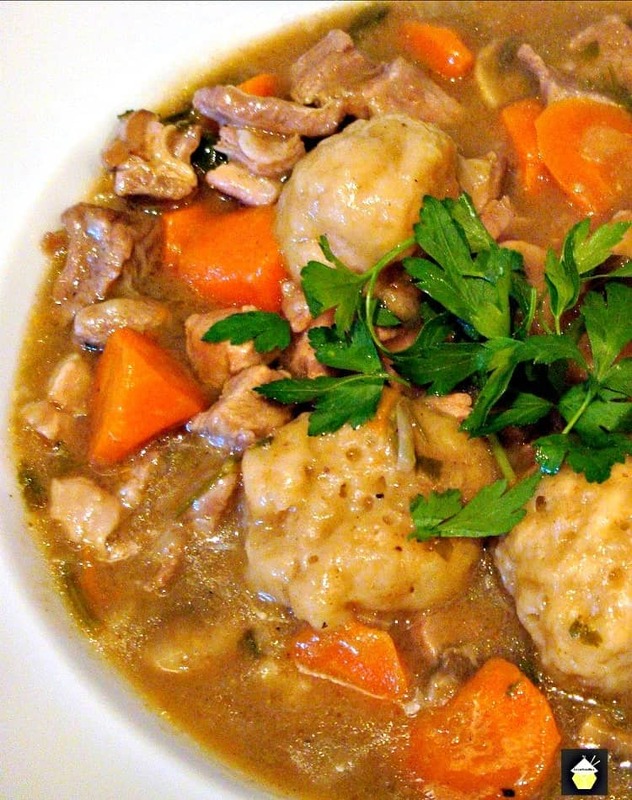 Grandma's Meat and Dumpling Casserole. Crock Pot or Oven, you choose! All fresh ingredients and so delicious! 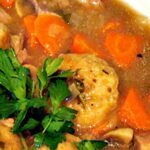 Grandma’s Meat and Dumpling Casserole! It uses all fresh ingredients and check out those dumplings! Yummy fluffy bites of heaven! 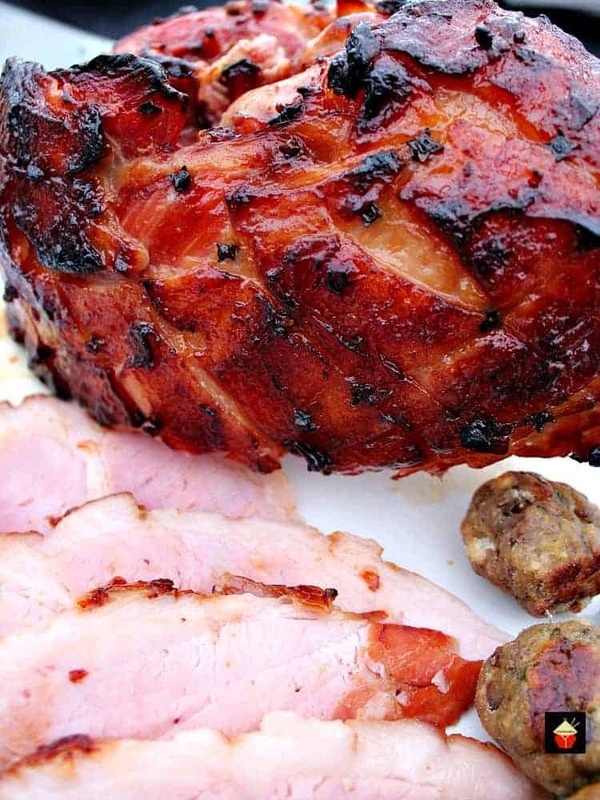 Crock Pot or Oven – you choose. 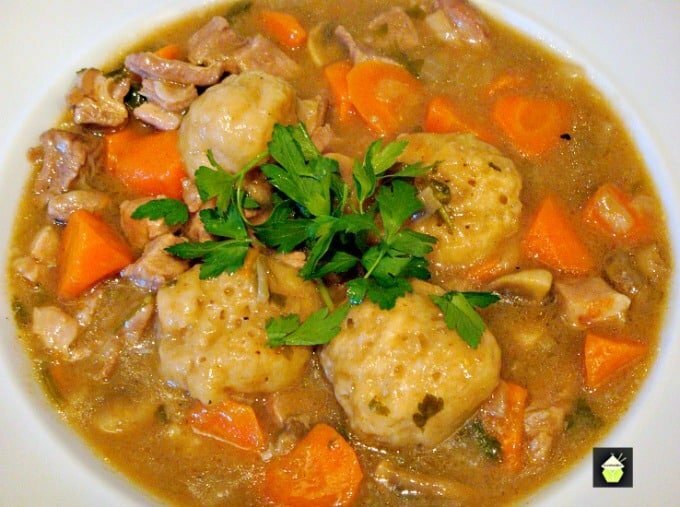 Grandma’s Meat and Dumpling Casserole! 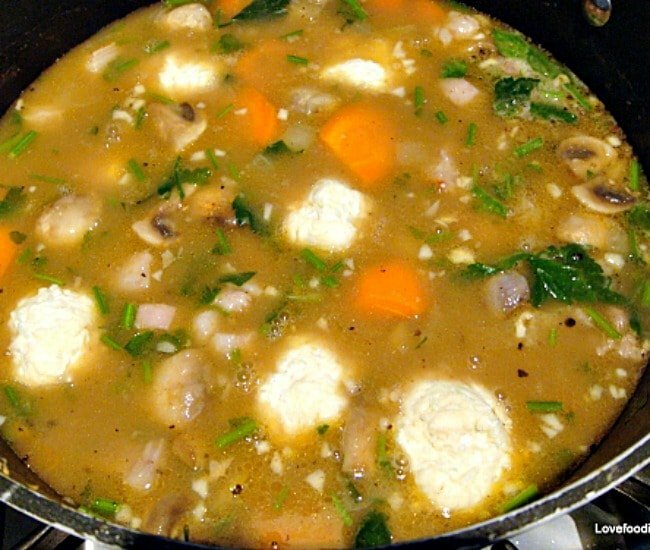 This recipe is so delicious and full of flavor! I’m very lucky to have had a grandmother who was Welsh, and also one who was Chinese. That way I grew up with influences in two completely different styles of cooking, and of course my family favourites are certainly varied! 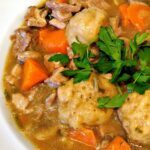 This recipe for grandma’s meat and dumpling casserole is one I remember with great fondness. My grandmother would make up a big pot, with a cheap cut of lamb (that is the national meat of Wales!) 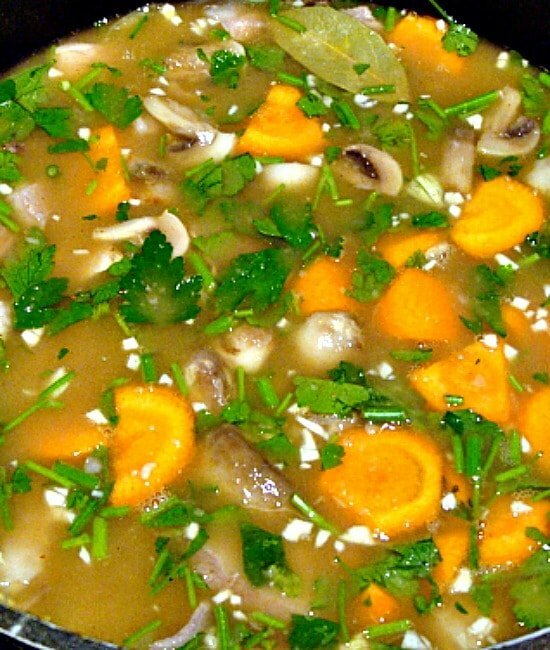 , pile in loads of carrots, swede, turnip, mushroom, and then top the casserole with these dumplings. They would start off their life as golf ball sized blobs floating on the top of the casserole, and then 2 hours later, they would have expanded nearly double in size. 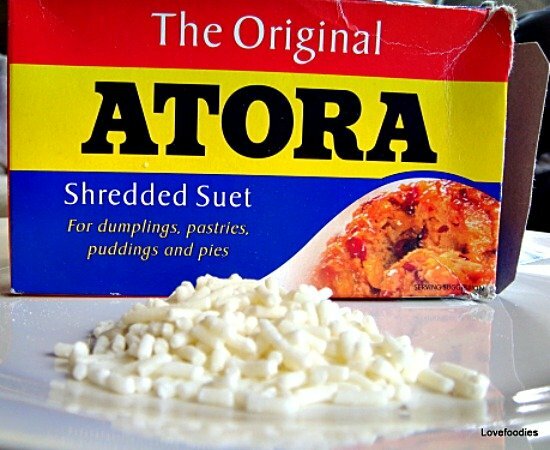 My gran would traditionally use suet fat to make these dumplings, and in many countries, this is still readily available to buy. However, I have experimented and come up with an alternative to suet, which is as close as I can get to my gran’s dumplings, taking into account a swap for the suet. If you have never had British Dumplings, please please try them! If you enjoy casseroles and heart warming food, I am sure you will enjoy this recipe. 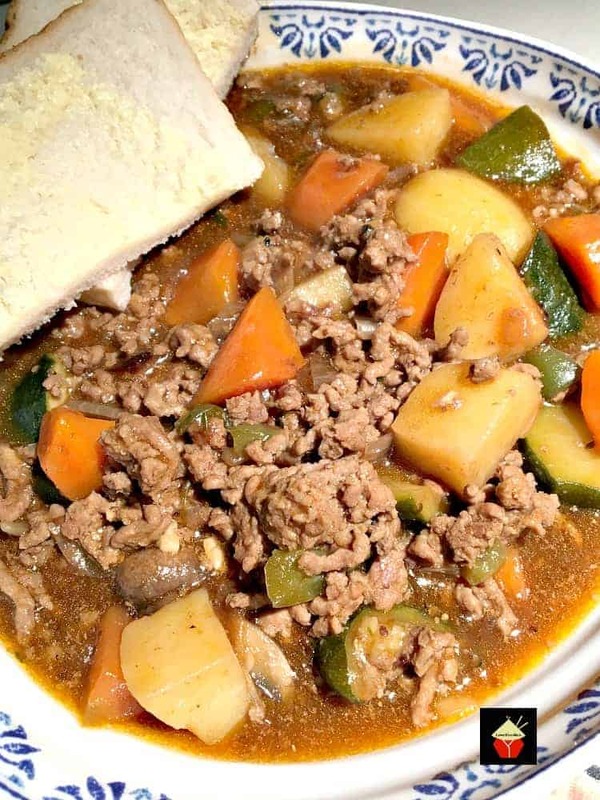 This casserole uses a cheap cut of beef or lamb. 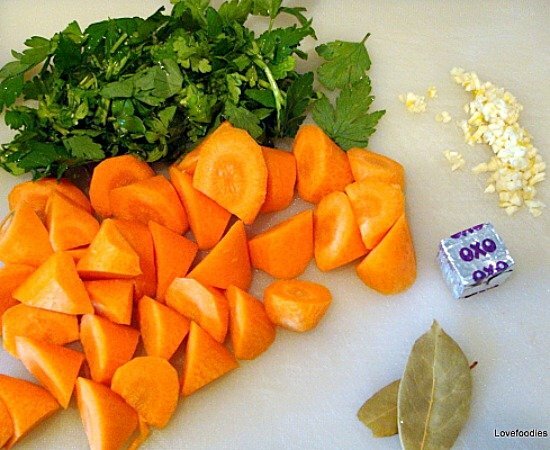 When cooked in this way, it will become incredibly tender. It is traditional to serve this with some mashed potato, although you really don’t need it…the dumplings are very filling!. I served mine with some cous cous, as I find mashed potato too much for me to eat! 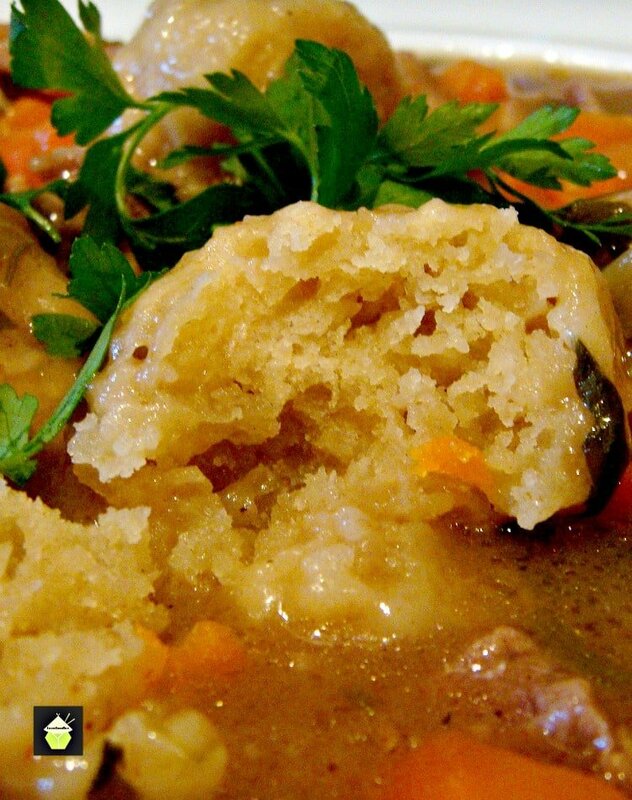 Let’s get straight to the recipe and please enjoy our grandma’s meat and dumpling casserole. swede/ rutabagas / turnip/ other root vegetables , Whole baby onions if you like them! 1 teaspoon thyme / rosemary / tarragon – you choose your favourite. 1/2 cup, 3.5 oz, 100 g crisco /suet, grated or shredded. If using Crisco, Please freeze it until it is hard enough and then grate it using the large holes on your grater (so it’s shredded). 5 – 8 Tablespoons cold water. ** NOTE** If using crisco for the dumplings, please remember to place your crisco in the freezer in plenty of time for it to freeze hard, so that you can grate it. 1. In the same pan you will use for the oven, add the olive oil, chopped onion, mushrooms and fry until translucent. 2. Add the meat and fry until brown to seal the juices. Add the flour and combine it all. 3. Add your other vegetables. They should all be bite sized pieces. 4. Add the remaining flavours (tomato puree, balsamic, herbs etc), and dissolve your stock cube in the stated amount of boiling water. Then add it to the pan. Leave to simmer on a very low heat whilst we make the dumplings. Now we make those delicious dumplings! 1. In a bowl, sieve the flour, salt, pepper & baking powder. Add the suet or grated crisco. 2. Using a flat bladed knife (if you use your hands you will melt the fat with your own heat!) mix everything together. 3. Adding 1 tablespoon of cold water at a time, continue using the flat bladed knife, to combine everything, cutting through the mixture, be patient, and add a little more, combine, add a little more, and after 6 or so tablespoons of water, the dough should come together. Do the final bit with your hand, the dough should not stick to the bowl or your hands, but be comfortable to touch. 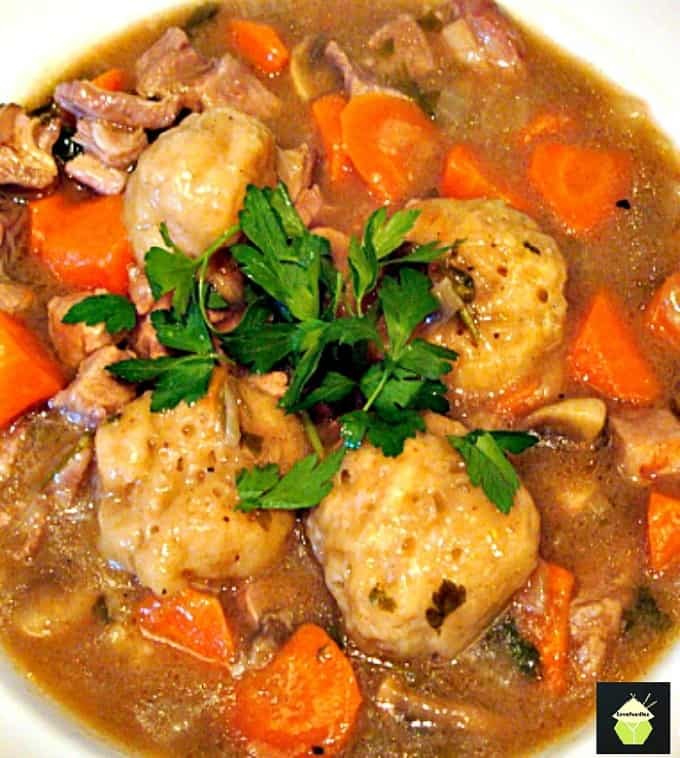 Shape into 8 – 10 golf ball sizes and place in the casserole dish, spread them around. Place the lid on the dish and put in the oven for 2 hours and enjoy the smells whilst it’s cooking! When it’s ready, serve on it’s own or with some mashed potato or cous cous. Delicious! 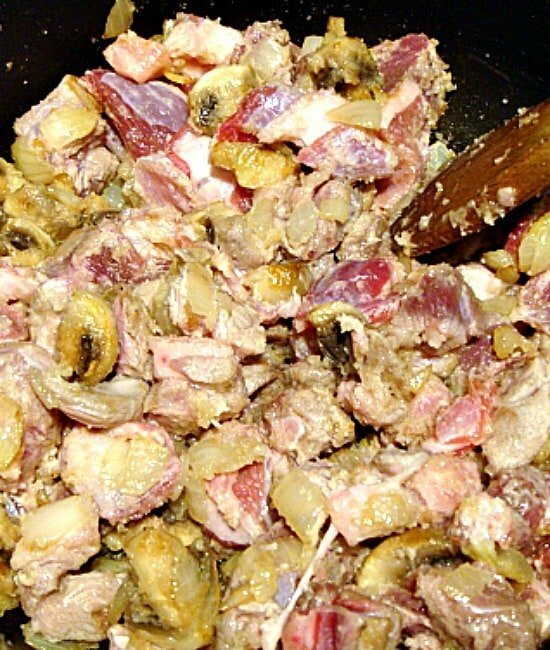 Please Enjoy a taste of my grandma’s meat & dumpling casserole! 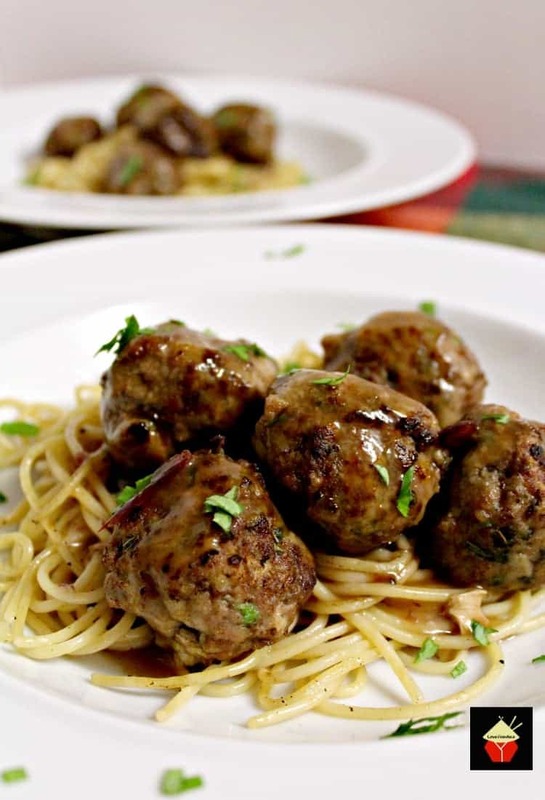 Here’s a few more delicious dinner ideas for you to enjoy! 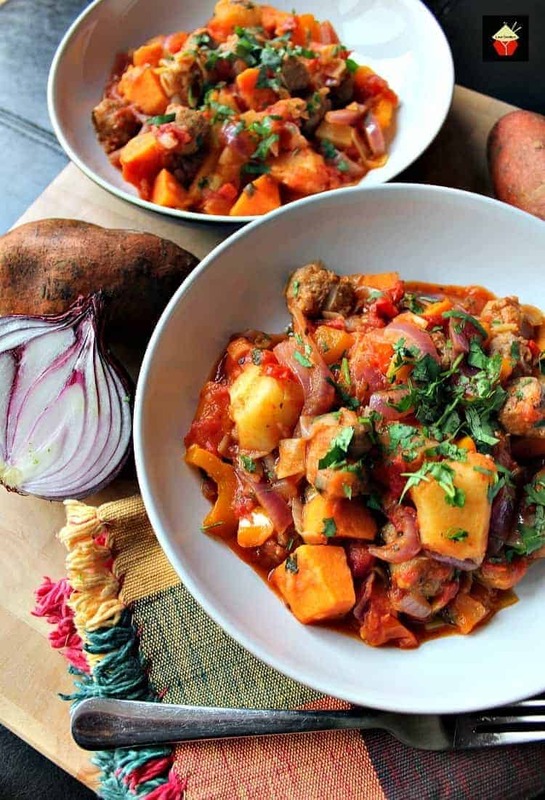 Sausage and Sweet Potato Dinner, all in one pan too! This recipe is one I remember with great fondness. My grandmother would make up a big pot, with a cheap cut of lamb (that is the national meat of Wales!) 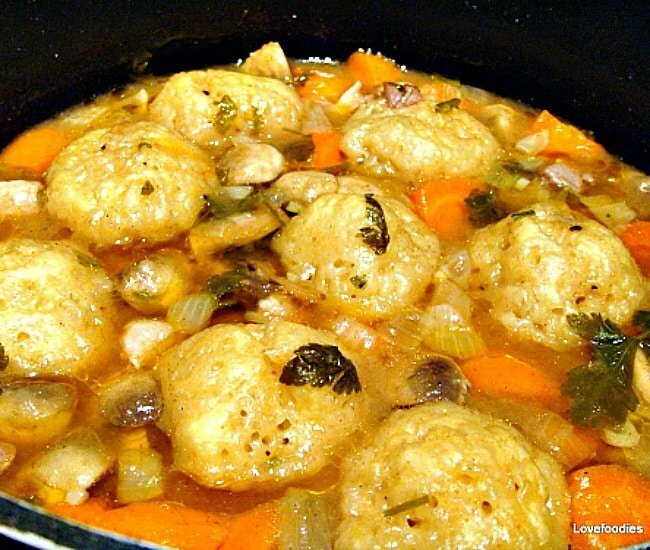 , pile in loads of carrots, swede, turnip, mushroom, and then top the casserole with these dumplings. They would start off their life as golf ball sized blobs floating on the top of the casserole, and then 2 hours later, they would have expanded nearly double in size. swede/ rutabagas / turnip/ other root vegetables Whole baby onions if you like them! 1 teaspoon thyme / rosemary / tarragon - you choose your favourite. If using Crisco Please freeze it until it is hard enough and then grate it using the large holes on your grater (so it's shredded). 5 - 8 Tablespoons cold water. 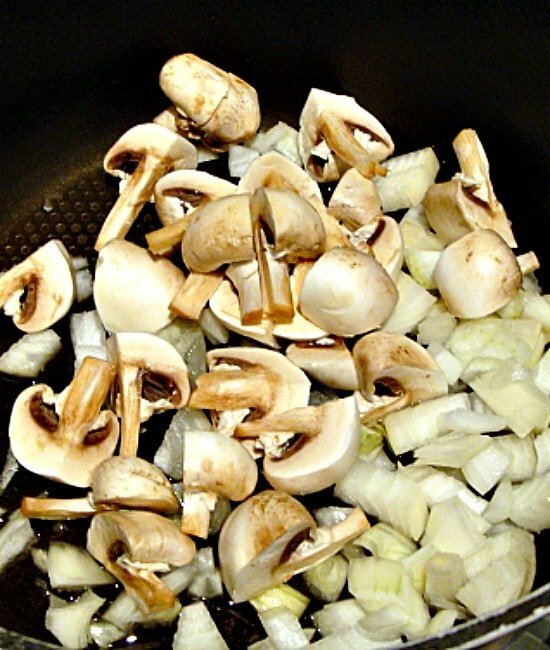 In the same pan you will use for the oven, add the olive oil, chopped onion, mushrooms and fry until translucent. 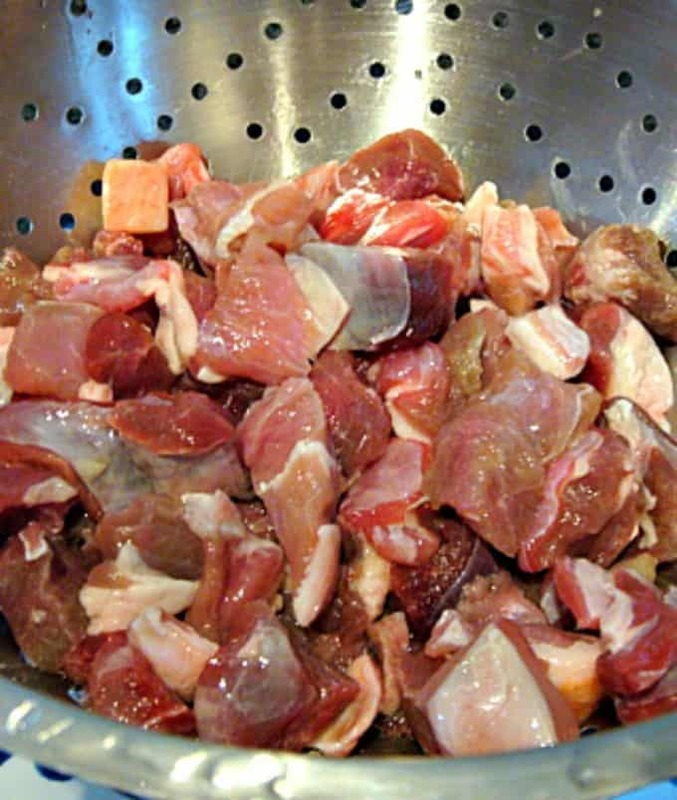 Add the meat and fry until brown to seal the juices. Add the flour and combine it all. Add your other vegetables. They should all be bite sized pieces. Add the remaining flavours (tomato puree, balsamic, herbs etc), and dissolve your stock cube in the stated amount of boiling water. Then add it to the pan. Leave to simmer on a very low heat whilst we make the dumplings. In a bowl, sieve the flour, salt, pepper & baking powder. Add the suet or grated crisco. Using a flat bladed knife (if you use your hands you will melt the fat with your own heat!) mix everything together. Adding 1 tablespoon of cold water at a time, continue using the flat bladed knife, to combine everything, cutting through the mixture, be patient, and add a little more, combine, add a little more, and after 6 or so tablespoons of water, the dough should come together. 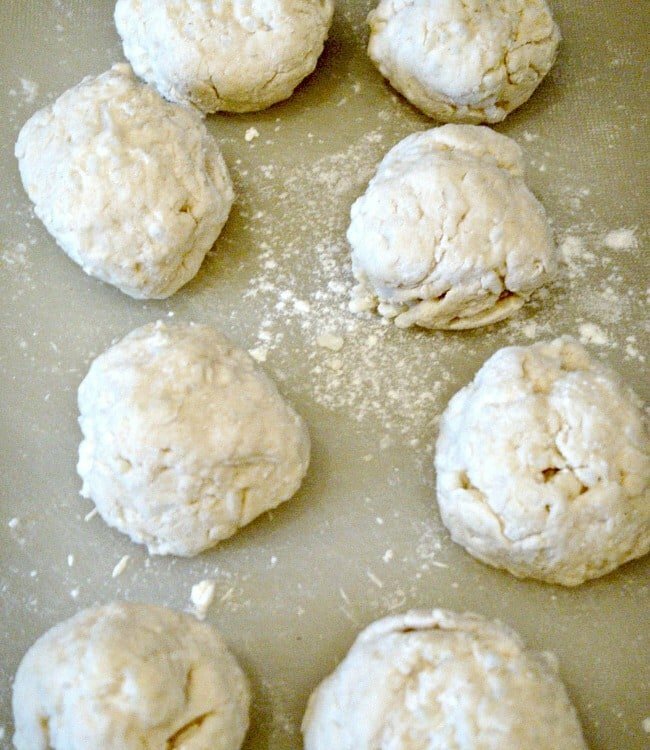 Do the final bit with your hand, the dough should not stick to the bowl or your hands, but be comfortable to touch. Shape into 8 - 10 golf ball sizes and place in the casserole dish, spread them around. Place the lid on the dish and put in the oven for 2 hours and enjoy the smells whilst it's cooking! When it's ready, serve on it's own or with some mashed potato or cous cous. Delicious! Please Enjoy a taste of my grandma's meat & dumpling casserole! If using crisco for the dumplings, please remember to place your crisco in the freezer in plenty of time for it to freeze hard, so that you can grate it.